This is for when you have a spare 20 minutes and want some eye candy for your eyes and literate commentary about art for your ears. 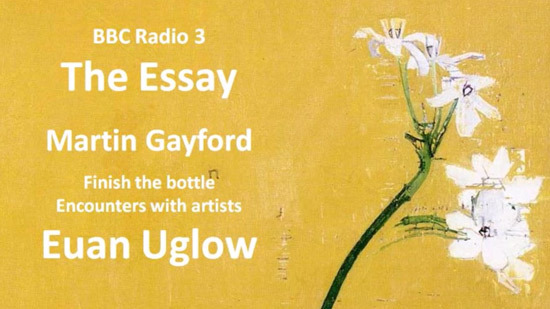 I do not have a clue who Raphael Hynes is who created the YouTube video - other than that he is an obvious fan of Euan Uglow. Posted by Making A Mark on Thursday, June 28, 2018 2 comments Who's linking to this post? 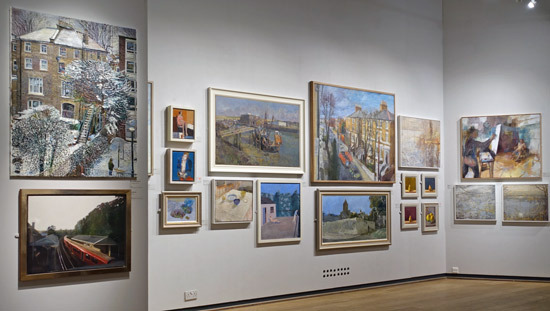 The Art of Collecting opens at the Mall Galleries tomorrow (until 6th July). 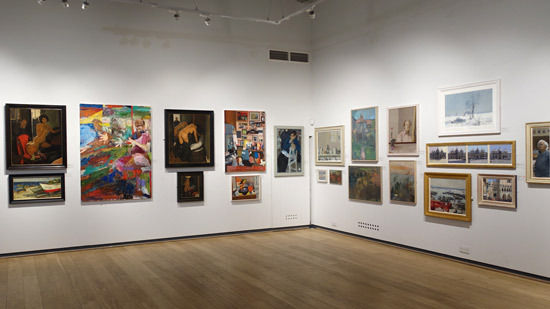 It comprises displays of selected works from four different and important private art collections in the UK - plus it has a room devoted to paintings by important women artists in those four collections. The Ingram Collection is the youngest Collection. It was begun in 2002 by Chris Ingram, a serial entrepreneur and philanthropist. 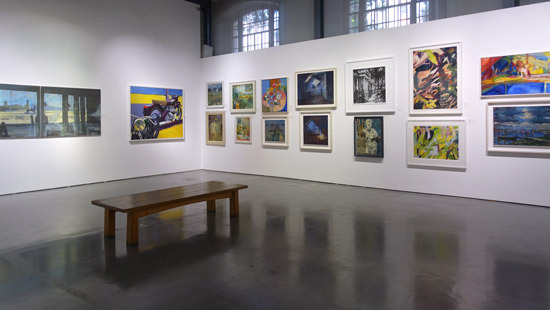 The Collection has over 600 works of Modern British Art and aims to provide opportunities to be inspired by art. It's generally recognised as the biggest privately owned publicly accessible collection of Modern British Art in the country. This is a trust related to just one artist, who was a leading member of the St Ives Group, and was established in 1987. The Trust was set up to maintain her legacy and promote her achievements after her death. I attended a preview last night and took a few photographs. It was fascinating to see some of the galleries used in different ways and containing the type of artwork not normally seen in the galleries. It's also an opportunity to see amazing paintings by some artists who are not often seen in London. 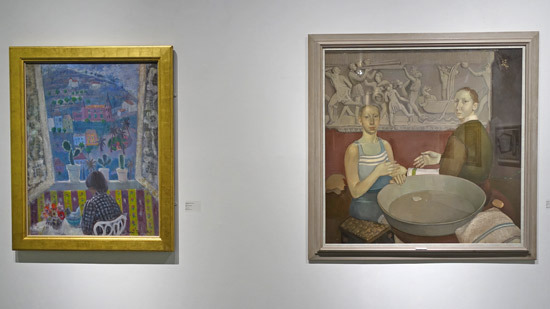 This part of the exhibition contains paintings by women from all four collections - including Rose Wylie, Aleah Chapin, Alison Watt, Chantal Joffe and Anne Redpath plus smaller paintings by Wilhelmina Barns-Graham. It was great to see a painting by Aleah Chapin again (see my interview with Aleah Chapin). You can see an interview between Chris ingram and Aleah Chapin after her first exhibition at the Flowers Gallery in London below. I also adore paintings by Alison Watt and was pleased to be introduced to the paintings of Anne Redpath. The exhibition is in all three galleries of the Mall Galleries until 6 July 2018. Admission is free. The bookshop has a number of relevant publications related to both collections and the artists in them. Posted by Making A Mark on Wednesday, June 27, 2018 0 comments Who's linking to this post? I'm toying with the idea of driving down to Broadstairs on the east cost of Kent tomorrow. 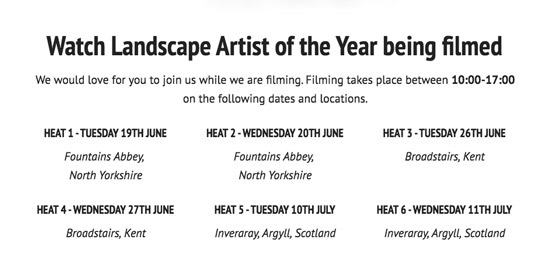 All in order to watch a Heat of Sky Arts Landscape Artist of the Year 2018 being filmed! You may have missed the final of Landscape Artist of the Year 2017 - which was repeated last night on ITV. The Sky Landscape Artist of the Year 2018 will be televised in the Autumn - probably starting in October. Here's the Google Map for the location - and an insight into the weather they're having. Posted by Making A Mark on Tuesday, June 26, 2018 0 comments Who's linking to this post? and 57 selected for the exhibition. Looks like Derwent fed the Judges while they deliberated at the V&A! Overall, the judges selected 67 artworks which celebrate drawing in all its diversity. This is the list of the 57 selected artists for the Derwent Art Prize Exhibition 2018. Links in their names are to their websites (if these can be found). Note this has still to be completed - but takes time! If you want the website to your name inserted please leave a comment with the correct url. Jonathan Alibone (UK) - based in Northampton; Currently a resident at The Sanctuary studios. He has exhibited widely, including at the Royal Academy Summer Exhibition. His work features in collections throughout Europe, Russia and USA. Jemma Appleby (UK) - Lives and works in London and Hampshire. 2006 - 2009 1st Class BA Hons Fine Art Painting, City and Guilds of London Art School. Selected for the Jerwood Drawing Prize 2014, Exhibits widely. Two of her charcoal drawings selected for Royal Academy Summer Exhibition 2018. Malcolm Ashman (UK) - an academician at the Royal West of England Academy (RWA). a member of the Royal Society of British Artists (RBA), the Royal Institute of Oil Painters (ROI) and the Bath Society of Artists. 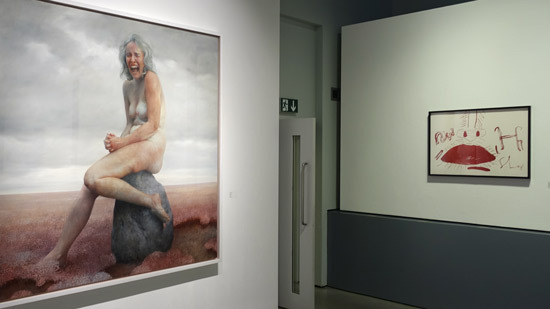 Exhibits in London and the south of England, including the Royal Academy Summer Exhibition, the Threadneedle Prize and the Royal Watercolour Society, Bankside Gallery, London. Martyn Burdon (UK) - Graduated from Brunel University in 2004. Lives and works in Buckinghamshire . Also selected for the BP Portrait Prize 2017 and as one of the 'Artist and Illustrator Magazine' 2018 Artists of the Year. Hipkiss (artist duo Alpha & Chris Mason) (UK/France) - Hipkiss is a pseudonym used for a British artist duo - Alpha and Chris Mason - based in Gers, Midi-Pyrénées, France since 2001. Kin Choi Lam - an artist based in Hong Kong. He graduated in 2012 from the School of Creative Media, the City University of Hong Kong. His art mainly focuses on the intimate aspects of daily life, while seeking elements of mystery. Lee Madgwick (UK) - b. King’s Lynn, Norfolk, England, 1980. Graduated in Graphic Design from Norwich University College of the Arts, 2003. Tecently elected as a member of the Royal Society of British Artists (RBA The drawing selected is ‘Shroud’ - see below and Twitter would suggest this is a return to drawing after a long break. The Derwent Art Prize Exhibition will be held in the Threadneedle Space at the Mall Galleries from 18 – 23 September 2018 from 10am – 5pm daily. Admission is FREE. 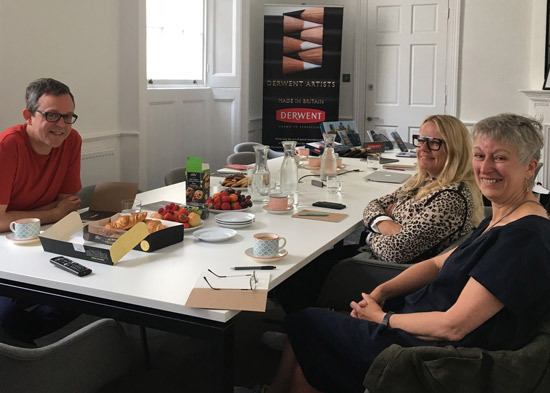 The Derwent Art Prize aims to reward excellence by showcasing the very best 2D & 3D artworks created in pencil or coloured pencil as well as water-soluble, pastel, graphite and charcoal by British and International artists. the Young Artist Award of £750 for an artist under 25 years of age. These are my previous blog posts about this award. Posted by Making A Mark on Monday, June 25, 2018 0 comments Who's linking to this post? This is about the five artists who have all won prizes in The John Moores Painting Prize 2018. The artist who has won the £25,000 First Prize will be announced on Thursday 12 July at The John Moores Painting Prize 2018 Exhibition at the Walker Art Gallery in Liverpool. 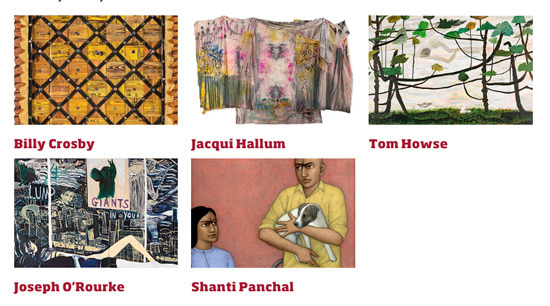 Each of the other artists will win a £2,500 runner-up prize. 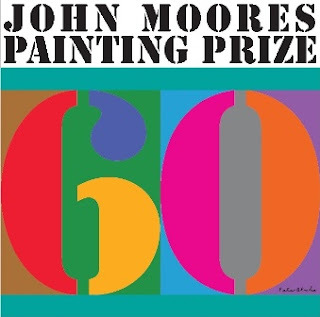 2,700 paintings entered for the John Moore Painting Prize 2018. The other shortlisted artists will receive a prize of £2,500. BELOW are images of the paintings and more information about the artist. Links in their names are to their websites or sites where you can find out more about the artist. Posted by Making A Mark on Saturday, June 23, 2018 0 comments Who's linking to this post? The Smithsonian’s National Portrait Gallery invites artists to submit one portrait in any media for consideration in the fifth triennial Outwin Boochever Portrait Competition. showcase excellence and innovation with a strong focus on the variety of portrait media used by artists today. The Outwin Boochever Portrait Competition is currently held every three years - 2006, 2009, 2013, 2016 to date. The next one is in 2019. "The Outwin 2019: American Portraiture Today" is a major exhibition of portraits selected as finalists and will be on view at the Portrait Gallery from 2nd November 2019 until 7th September 2020. Jurors: Who are the jurors for the 2019 competition? ...and how does the jury process work? Posted by Making A Mark on Friday, June 22, 2018 0 comments Who's linking to this post? I'm very late with my review of the Annual Exhibition of the New English Art Club this year due to its juxtaposition with the opening of the RA Summer Exhibition and the BP Portrait Award exhibition plus various other personal matters. However I visited on Tuesday (and again today) and found a good-looking and more colourful exhibition and lots of red dots. I will say however that this remains overwhelmingly an exhibition by members of NEAC. View the exhibition online too! 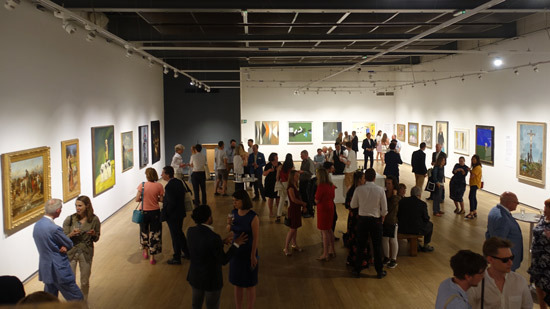 NEAC's Annual Exhibition 2018 continues at the Mall Galleries continues until Saturday 23rd June (10am - 5pm). You can also view it online, although I'd much prefer a way to navigate via pages tabbed with the start letter of the surname. Having to tab all the way through the entire exhibition to get to a non-member who has a surname starting with a letter towards the end of the alphabet is tedious in the extreme. 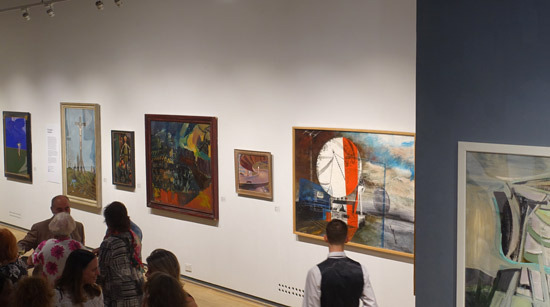 At present you cannot buy online via the NEAC website (although I'm guessing you can after the actual exhibition closes) - but you can make enquiries about works you are interested in right now via the Mall Galleries website - where the exhibition is also online. I'm not sure the NEAC Annual Exhibition still has that "thing" that says "This is a NEAC exhibition" when I walk in. While good looking on first impressions, it didn't make me go WOW! For a long time the NEAC Exhibition had a very distinct identity - as expressed above - and I think maybe it's lost that. I'm inclined to think it's maybe because the styles of members seem to have diversified over time. Not all to my taste I must confess! Below you can find images of the exhibition and some observations. I went back to see it again this afternoon as my SD card ran out of space on Tuesday. I find reviewing the exhibition again when I get home from the photos I take enables me to see things I sometimes miss while in the exhibition - notwithstanding the fact I scribble lots of notes! Posted by Making A Mark on Thursday, June 21, 2018 0 comments Who's linking to this post? This is about the LEARNING POINTS arising from the £99,000 claim for damages that a couple in Kansas were presented with - after their five year old broke a sculpture. On the one hand, the parents are "outraged" by the prospect of a bill £99,000 ($132,000) for their child pulling at / knocking off and breaking a sculpture. On the other hand, what about the artist who has just had an unsupervised child deprive them of the prospect of the proceeds from selling the artwork? So should children be allowed anywhere near artworks which are valuable? Or should galleries do better at protecting valuable art? Are bills for damages the solution? Would your insurance cover you? P.S. Who says the artwork is worth £99,000? As you might expect lots of people had lots of opinions - and there were lots of useful learning points which I said I'd summarise in a blog post. However first here's the unexpurgated Surveillance Video of the incident at the Tomahawk Ridge Community Center in Overland Park, Kansas. 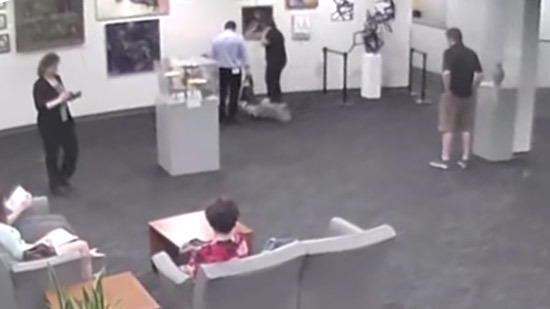 the boy who toppled the sculpture is five years old. Value - Who can say what an item is worth for the purposes of reimbursement? Health and Safety - Do all venues owe a vicarious liability for the health and safety of third parties visiting the venue? Parental Responsibility - what is a parent liable for if their children are not properly supervised? Is it an accident when parents have been negligent in their duties? Insurance - Who is liable? Who pays at the end of the day? Consignment paperwork - What does paperwork need to make clear? So I'll expand on each of these points below. Please note I'm not a lawyer and this is based on reading around and experience and does not constitute legal advice. Posted by Making A Mark on Wednesday, June 20, 2018 2 comments Who's linking to this post? 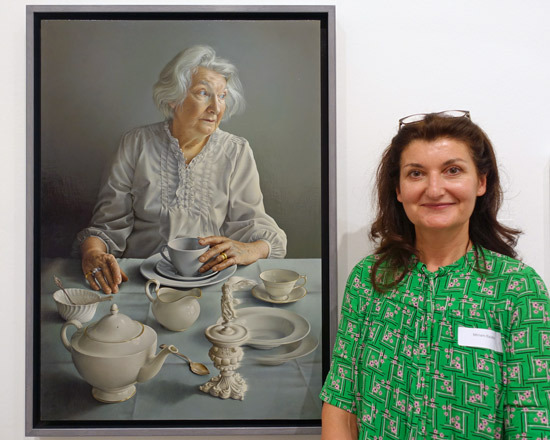 Miriam Escofet with the portrait of her mother "An Angel at my Table"
It's been my habit for the past few years to interview the winners of the BP Portrait Award on video - in front of their portrait in the National Portrait Gallery. Background noise in the gallery has always been a bit of a problem, however this year, the exhibition has changed galleries and, as a result, the acoustics meant that the noise levels were too loud for my equipment (my trusty iPhone!) and an interview in the gallery was impossible. Instead we went up to the Portrait Restaurant at the top of the building (where I was booked in for lunch) and did the interview there. We still had background noise as you will hear - but it's very easy to hear Miriam in the interview. You can view it full size on YouTube. Scottish National Portrait Gallery, Edinburgh - 15 Dec 2018 - 10 March 2019. I've also got another video to share with for those of you who can't get to see the exhibition - it includes my quick trot around the exhibition on Awards night. That'll be coming up later this week or next. 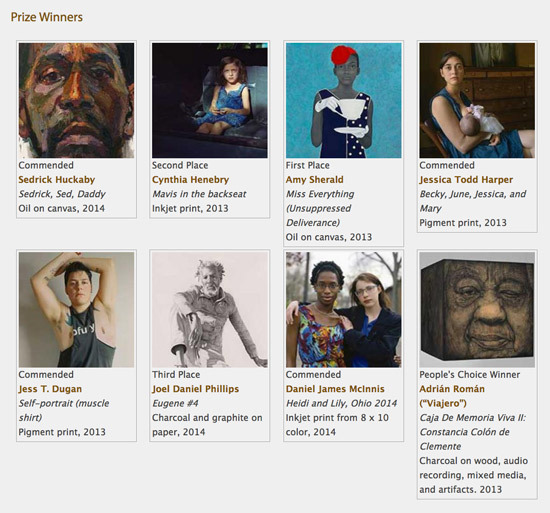 For those wanting to know more about the artists who win prizes at the BP Portrait Award. 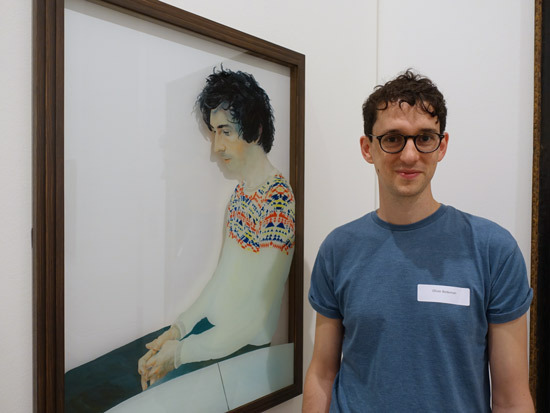 Or, if you want to know more about the artist, consult my posts BELOW about the prizewinners which all contain VIDEO INTERVIEWS with other artists who won BP Portrait Award prizes. A Profile of Aleah Chapin - includes her video interview which has now received over 142,000 views on YouTube. Aleah Chapin paints her aunties, cousins, mother and friends; old and new. Posted by Making A Mark on Tuesday, June 19, 2018 1 comments Who's linking to this post? 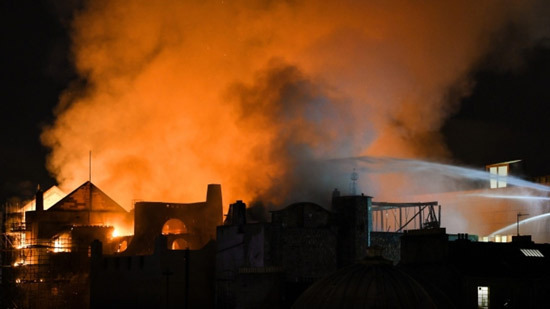 There have been a number of responses on social media to the tragic and devastating fire at the Glasgow School of Art. I've been talking today with people who didn't know the #GSA very well, particularly the inside of the library. So I've thrown together a quick sequence of Mackintosh's building at its very best. 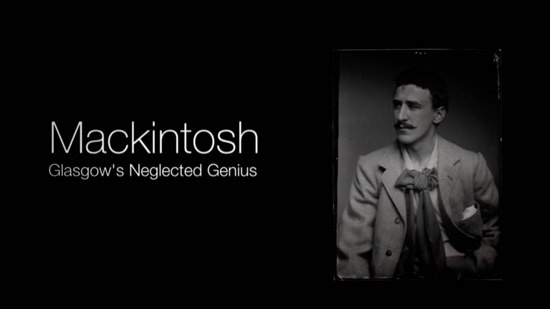 A short while ago, I was lucky enough to edit a documentary about Charles Rennie Mackintosh. When news filtered through of another fire in his masterpiece - the GSA - I quickly edited this collection of shots together as a memory of the building. 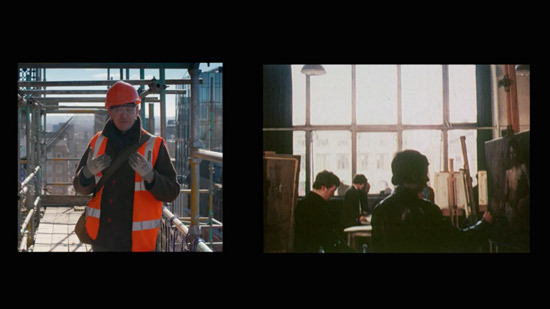 An Appreciation of Glasgow School of Art from Christopher Pitbladdo on Vimeo. The documentary which he references was highlighted in yesterday's post Lachlan Goudie on Charles Rennie Mackintosh - on iPlayer. A spokesperson for the British Automatic Fire Sprinkler Association said it was understood that automatic fire sprinklers had not been fully fitted as the building was still undergoing refurbishment from the 2014 fire.“However, it should be realised that sprinklers can be fitted in buildings throughout construction on a temporary basis, as there is a considerable risk from fire during this period,” the association added. This all makes it sound like it is a real person who has died, and in a strange way that’s not far off. 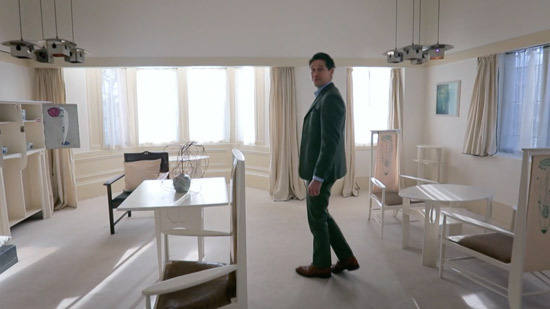 The sheer idiosyncrasy of the building, Mackintosh’s care and attention to detail, and its rich intellectual subtexts and simple vital presence gave it more personality – its own and its creator’s – than almost any building I’ve ever experienced. Posted by Making A Mark on Monday, June 18, 2018 0 comments Who's linking to this post? 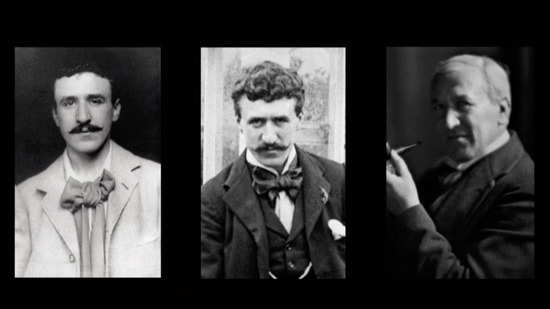 On 5th June 2018, BBC Scotland broadcast a programme on Charles Rennie Mackintosh (1868–1928) - Mackintosh - Glasgow's Neglected Genius. This is because 2018 is the 150th anniversary of the birth of the celebrated Glasgow architect, designer and artist - who was born on 7 June 2018. However, let's not forget that Charles Rennie Mackintosh made a lot of art in his lifetime and most of it is celebrated in this programme. You can view the programme on BBC iPlayer for the next 18 days. Below you can find my short summary and review of what the programme covers. 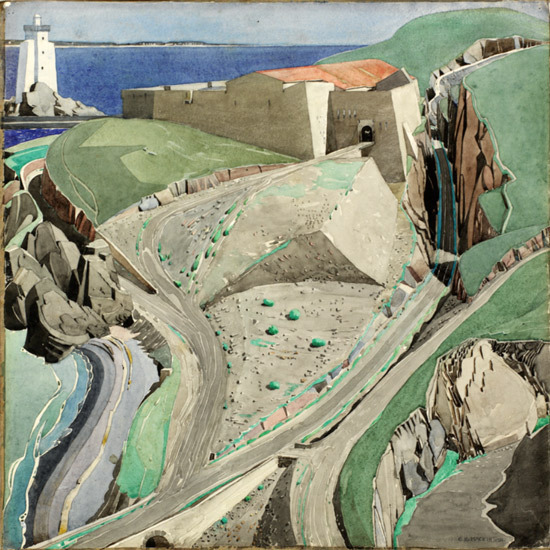 to living in the South of France in Collioure and Port-Vendres - you can see his wonderful watercolours of places he visited and painted in The CRM Trail and Charles Rennie Mackintosh in Rousillon (one of the sign boards features in the BBC film). These are some of my favourite watercolours of all time. The compositions are amazing, while the draughtsmanship is masterful and the colour palettes are true to the place and yet well co-ordinated. 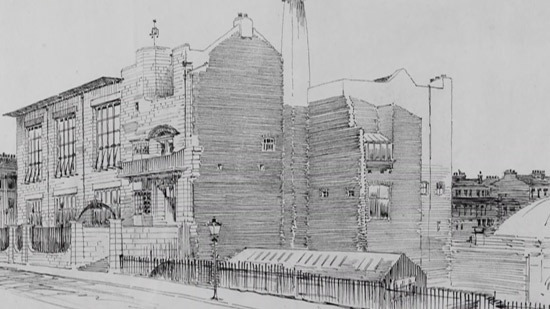 However I learned from the programme that Mackintosh wasn't averse to moving some of the features in the landscape if they made for a better painting - and illustrated what had happened in the painting of the watercolour below. 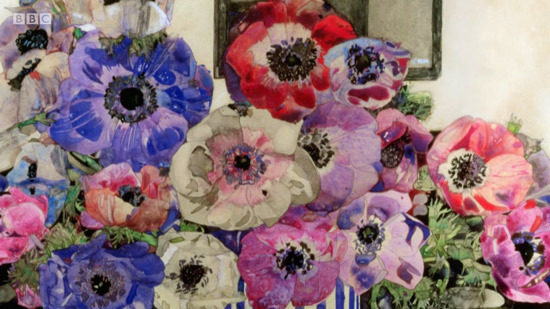 For more about these superb watercolours I recommend you read Charles Rennie Mackintosh in France: Landscape Watercolours by Pamela Robertson and Philip Long. The Mac after the Fire - an Archive, an Appeal and guess WHO! Posted by Making A Mark on Sunday, June 17, 2018 0 comments Who's linking to this post? 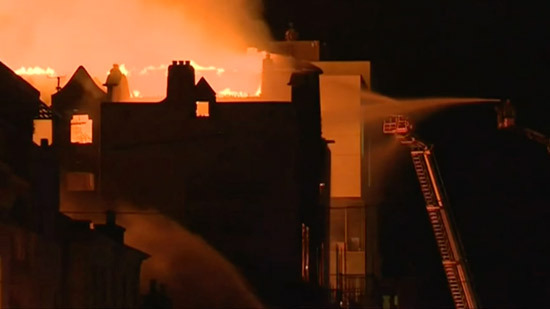 I could not believe my eyes this morning when I checked the news - and found yet more pictures of yet another fire at "The Mac" - the iconic and world-renowned Rennie Mackintosh building housing the Glasgow School of Art which was due to reopen in 2019 after the last fire in May 2014. This post provides links to images and accounts of the fire and the extent of the damage. What's really terrible is that accounts suggest that this fire is even worse than the previous one. It's certainly seems so from the images of the fire. 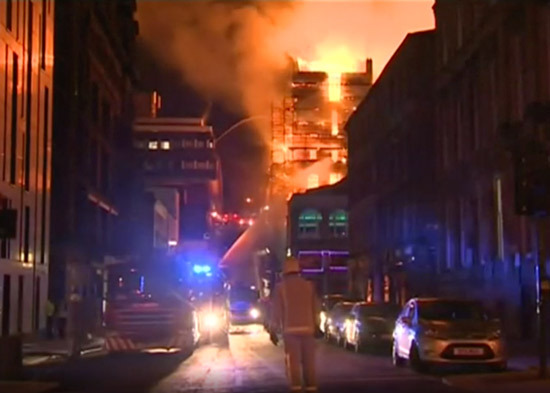 Damage to the Glasgow School of Art after a fire is "exceptionally significant", a senior firefighter has said. Posted by Making A Mark on Saturday, June 16, 2018 0 comments Who's linking to this post? This is about some of the artists whose paintings are included in the BP Portrait Award Exhibition which opened to the public today at the National Portrait Gallery in London. an insight into the age, education and experience of the artist and something of the story behind the painting. Not all artists are experienced and/or professional - a number are enthusiastic amateurs, others are starting out on their careers and some have been working as portrait painters for some time. an idea of the size of portraits selected for the exhibition - by including the portrait painter next to their painting! My photographs are some of the fastest portraits I create each year given the time available to meet, greet and take a photo and learn something of their painting! The painters in this post are from Europe and the USA with the following countries being represented: England, Scotland, France, Germany, Poland and the USA although interestingly the artists include two artists born in Italy and one born in Australia! I'm still trying to work out how come Brighton University got so many of its graduates into this year's exhibition - starting with the winner! Alastair Adams is a Past President of the Royal Society of Portrait Painters (the youngest in the history of the RP). He was previously selected for this exhibition in 1995. He studied at Hugh Baird College, Bootle and Leicester Polytechnic and started painting portraits in the mid 90s and became a member of the RP in 2002. He now works as a full time professional portrait painter working to commission rather than exhibitions e.g. Commissioned by the National Portrait Gallery to paint a portrait of Tony Blair. His work is held in numerous collections and has been seen in the exhibitions of the Royal Society of Portrait Painters(1996 - 2018). His portrait is of Bruce Robinson, an English director and screenwriter. He wrote and directed the loosely autobiographical cult classic 'Withnail and I' and wrote the screenplay for The Killing Fields. 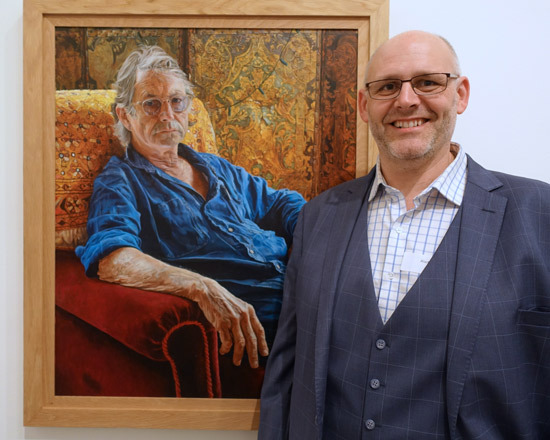 Adams met Robinson at an event in 2017 to mark the 30th anniversary of the release of his film Withnail and I and asked if he would sit for a portrait. The sittings to make initial studies and reference photographs took place over two days at Robinson’s home. Oliver Bedeman is a figurative painter who is based in Oxfordshire. He has previously been selected for The Threadneedle Prize in 2016 and 2018. He graduated from Brighton University in 2007 with a degree in Fine Art Painting. 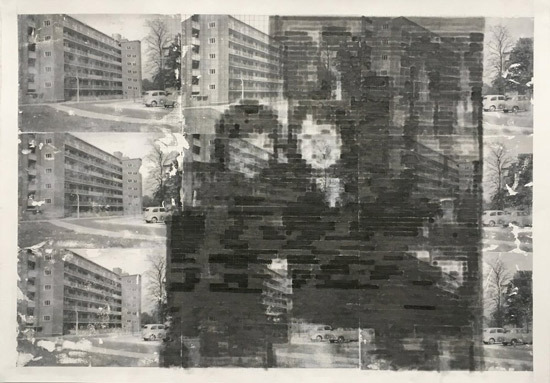 He then did the Postgraduate Drawing Year at the Royal Drawing School (where he won the Lady Rothermere Award) and the following year (2007-8) he was then the Artist-in-Residence, Royal Drawing School. In October, he has a solo exhibition"Silhouettes" at The Fine Art Society, London. Posted by Making A Mark on Thursday, June 14, 2018 0 comments Who's linking to this post? Fancy trying 'The National Art Pass'?